Builders warranty is often viewed in a negative light – but it doesn’t have to be such a bad thing. And it can actually be great for your business if you avoid making the common mistakes that other construction companies are making. As a construction business, the requirement to submit regular reports to meet builders warranty obligations can be time-consuming and frustrating. Despite providing a great service to your clients, all that red tape prevents you from growing. But have you considered the benefits? • It takes good planning to achieve the higher job limits – so when you get there, you will face less competition. • Rather than having dozens of individual clients asking about your financial strength, you only have to show one insurer. • Most importantly, the warranty is there to ensure that you have a strong and robust business. Therefore, it’s a blueprint for success and prosperity. 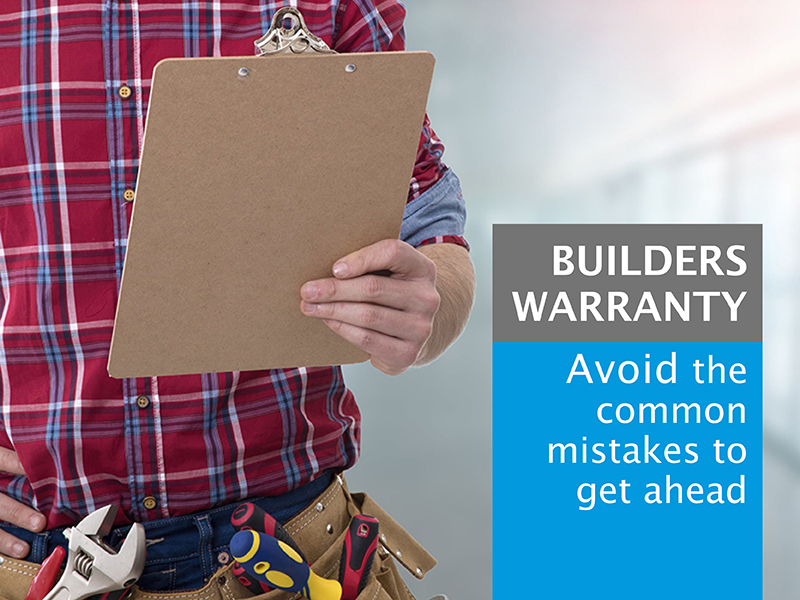 8 common mistakes with builders warranty…. This can be more cleverly managed so that you get the best tax outcome and also asset position for warranty purposes. The problem with this is that the insurer will reduce your net assets position (ANTA), potentially requiring you to contribute further cash yourself. When the right systems are used, like cloud platforms such as Xero, it should be pretty simple to respond to any questions raised by warranty. Accurate reports should be available at the click of a button. Warranty love it when you can not only answer their questions but also do so quickly. You’re far more likely to get a favourable result. Not only does this impact on your own cash flow but warranty have specific tests regarding how quickly invoices are paid and how much is owing at any one time. They hate to see overdue invoices, so urgent action needs to be taken. Cash is king from the insurer’s perspective and projects the strongest financial position to warranty. Make sure that at 30 June of each financial year your bank balance is as healthy as possible. Sometimes, not enough cash is injected into a new business to support the jobs it wants to undertake. If you don’t have the money (or equity) to start, then a strategy to improve this can be implemented. This creates a situation where you fall overdue with the ATO. Warranty will check this and if you’re not up to date with the ATO, a red flag is raised. If you’re looking to grow your business then, at some point, warranty will want to see gross margin reports for each individual job. It’s a good practice to start this well before warranty asks for it; cloud accounting software makes it quite simple. Overall, warranty look at 24 different financial indicators relating to your business and each has a flow-on effect to the next. That’s a lot to manage and would look like a daunting task to anyone! But this is what we do day-in and day-out. Call us on (02) 9949 6719 and start tapping into our pool of expertise when it comes to builders warranty.